The Talking Box: Is that Your Final Answer? I've mentioned before that certain shows have a lot of meaning to me (like Full House causing me to choose Tuesday as my favorite day of the week), and I'm sure that you can single out meaning from other shows just as well. But I think it's a little more difficult to say the same about game shows here. Perhaps Wheel of Fortune makes you think of a grandmother with whom you always played. Or you might remember watching The Price is Right on sick days. But, of all the game shows I can think of, the one that means the most to me is Who Wants to be a Millionaire. You see, it was rising to fame as my now-husband and I began dating, and we'd watch it while on the phone with one another. Silly teenagers, I know. And he didn't have cable, so he only had a handful of channels, not super-clear or anything. But, he knew I enjoyed playing with him, and so we'd talk about the answers and whatnot, learning all sorts of bits and pieces of trivia. There's a bit more to the story behind the meaning, but let's leave it at that for now. Today, I present Who Wants to be a Millionaire. Brief history: The show originated in Great Britain, with Chris Tarrant as the host. The name of the show comes from the Cole Porter song of the same name. You have to answer multiple-choice questions, winning a possible million pounds at the end. Most international versions have you win a million of that currency, unless the exchange rate is way off. The big difference between Who Wants to be a Millionaire and most game shows is that only one contestant plays at a time, and speed isn't a factor. Similar to The $64,000 Question, the potential winnings doubled after each question, with the potential to lose it all with an incorrect response. It first aired in September 1998, and the first board game rolled out in 2000. 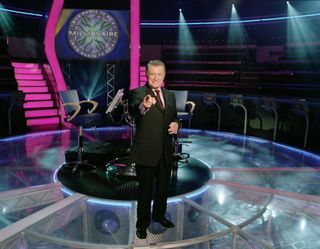 There was a 12-episode Who Wants to be a Super Millionaire in 2004 that featured 15 questions with higher dollar values. Tournaments and other spin-off type shows have also been seen. You can find old Regis episodes on GSN, and the syndicated episodes are still going. The game: Ten people are introduced, then given four items to put in a certain order. The first person to get the order correct gets to play the actual game. This round is called the Fastest Finger segment, and in early episodes was a regular multiple-choice question with the person to give the fastest correct answer moving on. The player then moves on to answer one question (with four choices) at a time. The level of difficulty generally increases, and after the first few questions, the host asks if the response the player gives is their "final answer," since the players have unlimited time to make their decision and often ponder several options before deciding. If the player doesn't think that they know the answer, they can walk away with the money they've won so far, rather than risk losing it. There are a few safe areas - after you pass the $1,000 and $32,000 marks (questions 5 and 10, respectively) you are guaranteed to win those amounts. There are also three lifelines available to you: you can Phone a Friend (you've given a list already of possible friends and you pick one when you see the question. you get thirty seconds with them on the line), 50/50 (remove two wrong answers, leaving you with two to pick from), and Ask the Audience (poll the audience to see what their guesses would be!). You get to use each one once, whenever you want. Regis Philbin was notably the first host for the show in the US, from 1999-2002. His version was explosively popular, even leading ABC to put the show on 5 nights a week for a while, with episodes only taped a single day before they aired. It was also famous at that point because you could call in, take a phone quiz, and be entered for a chance to be on the show. There would be another phone round, then you'd be flown to NY to compete if you passed! Notable changes to the way the game is played: In the US, the Fastest Finger segment does not exist in the daytime syndicated version. In some countries, the number of questions vary - like 11, 12, 14, 15, and 16. In 2008, the US also changed the format to make time matter... you only got 15 seconds for questions 1-5, 30 seconds for questions 6-10, and 45 seconds for questions 11-14. Any leftover seconds with every question bought you extra time on your final question - you also got to know the category of each question before it was asked in this version. In 2010, the format changed again - removing the clock and shuffling the questions. This meant that you didn't know how much the question was worth until you gave your final answer. The level of difficulty was not tied to the value of the question. A new lifeline was added - Jump the Question, which allowed you to skip a question... once you skipped it, you found out what it was worth. This is how the first 10 questions are played, for a maximum $68,600 win - if you chose to leave early you won half of what you accumulated so far. The final four questions are done like the older versions - each worth an increasing amount and increasingly difficult - no categories given, either. The biggest change has been the lifelines. In the US, the 50/50 and the Phone-a-Friend were discontinued. (the Phone-a-Friend was removed because people were googling the answers). Ask the Audience was expanded to include any AOL IM user who wanted to participate. 2004-2008 had a Switch the Question option, which let you swap out a question after the 10th correct answer. There was a Double Dip for a while, which allowed you to give a second "final answer" if your first choice was wrong (I've personally never seen an episode with this lifeline!). And, there was a Ask the Expert, where you could call a pre-arranged expert for advice, though their expertise was not always related to the question. Special contestants: Actually, there are both special contestants and special hosts. On the syndicated version, there have been a plethora of guest hosts, including Al Roker, Steve Harvey, DL Hughley, and even Regis Philbin. There have been celebrity editions, brides-to-be games, college weeks, family teams, and teacher versions, among other specialties. Regis was even a contestant during the 10th Anniversary special. 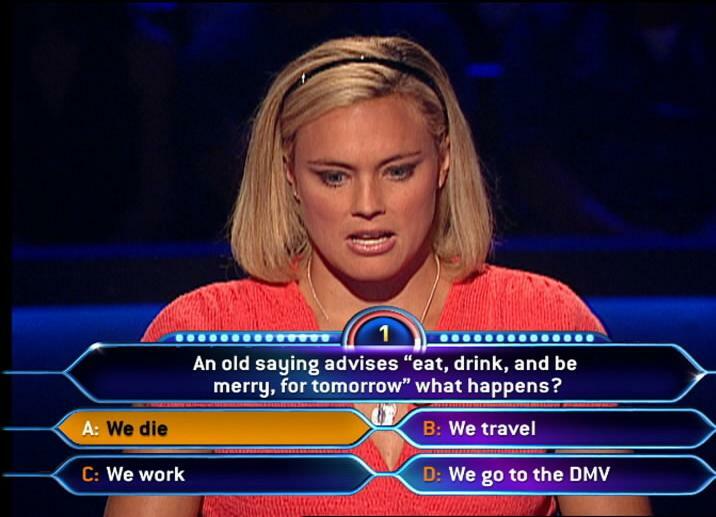 And, fun fact: on the US versions, only one person has ever gotten to the $1,000,000 question and gotten it wrong. Everyone else has either walked away or gotten it correct! AND, that one person was during that 10th Anniversary special! I think my favorite contestant was John Carpenter, back in '99. You may remember him as the first person to win the million, and he did it without getting help through lifelines, though he did Phone-a-Friend his father on the final question to tell him he was going to win! Favorite Rounds: First, I'm a classicist for this show, so I definitely prefer the old, primetime Regis episodes. Also, I really enjoyed the episodes that were part of those 10-episode gigs, where the show would then disappear for a few months... it really added to the excitement for me. And, like most people I believe, my favorite rounds are the later ones... the suspense is just so much higher! My take: I'd compete if given the opportunity, and I think I'd do well. I actually know someone who has been on the syndicated version, and he did well. Of course, I'd need to get different questions to do well, but they're all so random there's no way to know, LoL. My downfall would completely be in the fact that I don't always trust my instincts, and that I have a difficult time walking away. What about you? Did you ever watch Who Wants to be a Millionaire? Did you watch the original Regis episodes, or just the syndicated ones? Are you sad that they changed the lifelines?